Art has always been a special part of the early childhood experience. Many of us have great memories of donning a smock and getting messy with some paint. At Fairmont, we are so fortunate to have Mrs. Vogel sharing her passion for art with our young students. 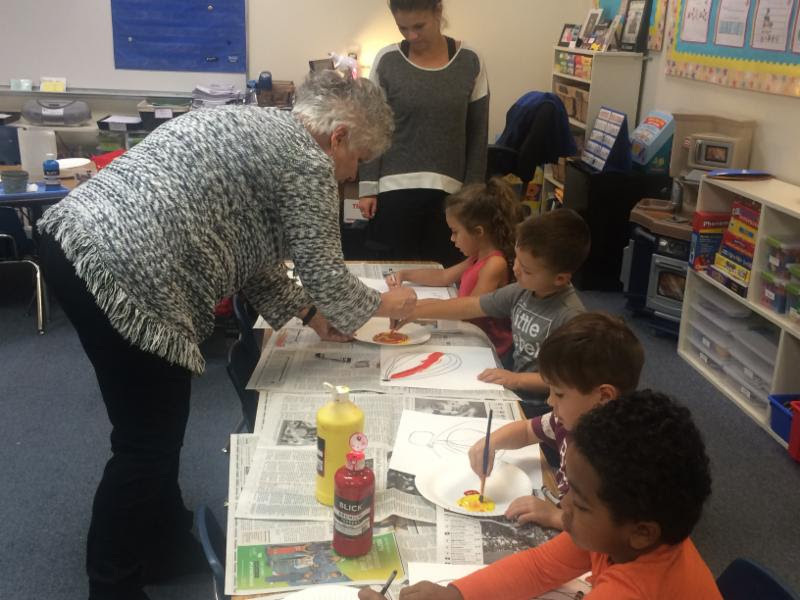 Each week junior kindergarten and kindergarten students visit Mrs. Vogel’s art room for a specialty class, and pre-kindergarten students are taught by Mrs. Vogel in their classroom during Afternoon Enrichment. Preschool teachers learn techniques and fun art ideas from Mrs. Vogel, which they then use to plan the exciting art that preschool students create each morning. Art is of course fun and exciting for kids to engage with, but did you know there are also many benefits to their growth and development? As early childhood educators, we emphasize the importance of art as a process rather than a product. The benefit to children comes from their ability to explore and engage with the experience, not from correctly following step-by-step directions. Socially and emotionally, art helps children to relax, focus, feel successful, and express their feelings. It provides an outlet for free expression and allows them to create without limits, which promotes confidence and self-esteem. They learn to accept and give critiques and praise, and choosing which materials to use and what to create is great practice in independent decision making. Art also stimulates cognitive development as children explore with different senses, plan and compare their work, problem solve with colors and shapes, and practice spatial reasoning. Self-evaluating their art to decide what to add or which color or media to use is a key step in learning to negotiate their environment. Using symbols to depict objects and feelings fosters vocabulary development and is a foundation for understanding words as a representation of the things they describe. Physical development is a large component of art as well, as children fine-tune gross motor skills with painting, writing, gluing, drawing, manipulating clay, using scissors, and more. Believe it or not, art even promotes language and literacy as children discuss their art, describe their product, and write (or dictate to a teacher) a description. Fairmont is grateful for the experiences Mrs. Vogel creates for our young artists each week. You can support all of this development at home as well by providing a variety of art supplies for your child to create with. Let them explore, engage with them, and foster creativity as a family. You might find that even you can enjoy the emotional benefits of letting go with the experience!